Angelina Jolie is the creature that goes bump in the night. In Disney’s Maleficent, she shows us a side of her that we’ve never seen before. 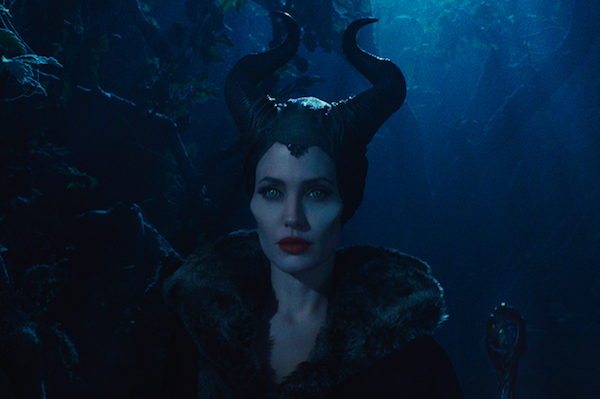 Angelina Jolie embodies Disney’s greatest villain in Maleficent. The Oscar-winner stars as the title character in this new take on Sleeping Beauty. Instead of focusing solely on Princess Aurora (Elle Fanning), Maleficent turns the story on its head. Disney’s unleashed a new trailer for the summer blockbuster that shows Maleficent in the worst light. Don’t get us wrong, Jolie’s a beautiful woman, but as Maleficent she becomes otherworldly. The horns are just the tip of the iceberg. The angles on her face are accentuated making her appear more menacing. Also, who can ignore those glowing eyes, which have hints of green and yellow. Green as in the envy she feels for Princess Aurora. Historically, Maleficent has been considered the leader of the Disney villains. She’s a sorceress who could put every other baddie out of business. With Jolie filling her evil shoes, the good guys don’t stand a chance. The latest trailer gives us a glimpse into Maleficent’s relationship with Princess Aurora. Since her birth, the young royal was cursed to prick her finger and fall into a deep sleep. But there’s much more to the story. What really caused Maleficent to turn into such a cold creature? The film co-stars Sharlto Copley, Sam Riley, Imelda Staunton, Juno Temple and Lesley Manville. It’s produced by Jolie and directed by Robert Stromberg. Maleficent opens in theaters May 30.